If you include situations where a road continues under the same number but in a different class, this is not terribly uncommon. In California, I-15, I-110, I-210, and I-238 all continue under the same number but as state routes instead of Interstates. In Pennsylvania, US 222 continues as PA 222 in Allentown. I was also going to suggest I-378 as a historical example, but I believe the non-freeway portion south of the Lehigh River wasn’t designated as PA 378 until the Interstate designation was removed. In California I-710 was going to continue as CA-710 if the freeway was going to expand from Alhambra to Pasadena at the CA-134@ I-210. Also there were old maps showing that there was going to be a CA-380 west of I-380@ I-280 interchange in San Bruno. There are also lollipop-shaped routes that intersect themselves. Like QC 132, which loops around the Gaspe Peninsula and back to intersect itself near Mont-Joli. No such rule in Michigan. We currently have I- and M-69, 75, 94, and 96; US-10 and M-10; US-24 and M-24; and US-45 and M-45. Used to be even more. Michigan actually originally made a point of assigning nearby M and US routes the same number. Thus we used to have US-112 and M-112 running parallel only about a mile or so apart between Detroit and Ypsilanti, M-131's southern terminus used to be at US-131's northern terminus, and similar with 24 and 25. Most of Michigan's current number duplications are far part enough that there's no confusion, although I-96/M-96 aren't all that far apart, nor are I-75/M-75 and US-24/M-24. 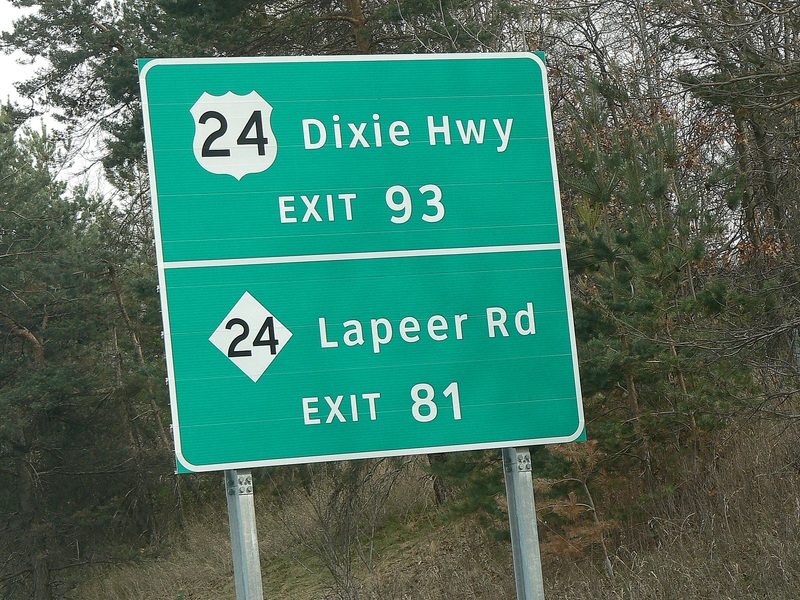 The latter have interchanges with I-75 only 12 miles apart and there are signs on I-75 to remind motorists of the distinction.